Vanda Brotas participated on a conference included on the program CCOceanos 2019 – sponsored by Vodafone, on the 14th February 2019, where she highlighted the importance of PORTWIMS for the development of expertise on Earth Observation in Portugal. This programme consists of a set of conferences for the general public, which are recorded and streamed in Portuguese. Vanda Brotas gave a presentation in January 2019 at the Atlantic4Space Workshop in Southampton, UK titled "Survey of Earth Observation activities conducted at the University of Lisbon on the Northeast Atlantic" which included presentation of the PORTWIMS main objectives. Download the slides from the presentation. 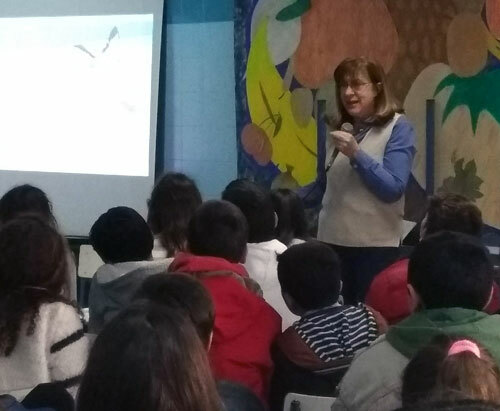 On 1st December, Vanda Brotas launched a Portuguese children’s book “The girl who could see the sea with different colours”, which aims to call the attention of 8-11 years old to the role of phytoplankton in the marine ecosystem and the way Earth Observation satellites work. The book is published by Gradiva. The PORTWIMS team is planning to translate it into English during 2019, in order to be published for a wider public. The book is sponsored by Ciência Viva which is the major Portuguese Governmental Agency in Science Communication and Outreach. Vanda used her book to explain to 10-12 year old students what is the colour of the ocean during a school visit in March 2019. She used the book to help explain what phytoplankton is, it's importance and how satellites can observe the colour of the ocean. A menina que via o mar de várias cores. Gravida publishers.